The For Dummies series of instructional books is undoubtedly a popular choice for people wanting to learn about new topics. 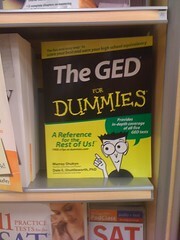 Thus, it would be natural to assume a GED For Dummies book would exist – and it does! At a price of eighteen dollars, the GED For Dummies could be the key in helping you pass the GED test and earn your diploma! The book contains two full GED practice tests to help individuals get accustomed to the GED test format, as well as identify what parts of the GED they need more practice on. The detailed answer key supplied along with the test makes it possible for people to learn exactly what they did wrong, so that they are able to improve and not repeat the same mistake a second time. The book is divided based on the five subjects tested on in the GED exam: math, science, reading, writing, and social studies. A typical breakdown of a chapter includes tips and techniques about dealing with a respective section, followed by two practice tests and their explanations. As you may be able to tell, this book does not serve as a full study course for people to learn the material. This book is designed for people who understand conceptually the type of questions that are going to be asked on the GED exam and just need more practice. The major benefit of using GED practice books like GED For Dummies is that you are able to simulate what a real GED test would be like. It is important to sit down with a pencil and paper, and complete the practice exams provided in the book under the appropriate time limits so that you can manage your timing and learn how to deal with time pressure. After all, it’s better to figure out you have timing issues beforehand rather than on the day of the test. GED For Dummies can be bought off the For Dummies online store, but cheaper versions can usually be found elsewhere (the For Dummies store sells it for eighteen dollars, Amazon sells it for eleven dollars). Most bookstores should also supply the book, if you rather pick one up locally. To clarify, this book is perfect for those in need of a quick review and practice. For people who need to learn the material, a more extensive GED preparation book will be a much better fit.